I’ve always loved grilling, especially throwing some nice cuts of meat on my Weber filled with charcoal. There’s nothing like the taste of food cooked over open flames. But this year I’ve stepped it up a bit and I think it’s for two main reasons: (1) We now have a partially-covered patio where the grill can sit conveniently and (2) I now work from home so I now have the time to fire up the coals on any given night. People who see my grilling photos on Instagram often ask me about my tools and techniques so I’ll describe my grilling set up here. To begin with, I’m a charcoal guy. A few years ago I bought a cheap propane grill on Amazon to supplement my charcoal grill and I regret that decision. I thought the convenience of propane would be useful, but I still prefer the charcoal for the smoke and flavor and it doesn’t take that much more time. My grill is a 10+ year-old Weber Performer Deluxe, which is their standard 22-inch kettle with an attached side table and a charcoal bucket. The grill includes a propane charcoal lighter system that I never used and I use the charcoal bucket as storage, but overall I’ve loved it. I notice they’ve made some improvements over the years, especially to the table material, the wheels, and the ash catcher. But my grill is still in pretty decent shape for how old it is and how often I use it. I did replace the cooking grate once because it got rusty over one winter, but I’d say that’s pretty durable. Instead of the propane starter, I swear by the Weber Rapid Fire Chimney Starter. I never want to taste lighter fluid on my food, so I just dump all the charcoal in the top, put a wad of paper underneath, light the paper, and in 15 minutes the coals are lit and ready to dump. No muss, no fuss. I never scrape the great after I’m done cooking, but just let it sit until the next time I light the grill. That way, while I’m letting the coals and grate heat up, I’m burning off the remnants of the last grilling session. To scrape the burnt bits off the grate, I use the Best BBQ Grill Brush, which despite it’s hype-ish name is really the best. Unlike some brushes, the bristles aren’t going to come off in my food and it does a really good job of scraping the grate without too much effort. To protect my hands, I avoid regular old oven mitts and go right for the welding gloves. The US Forge 400 Welding Gloves are perfect for me. They give me enough dexterity to grab tools or plates, but also offer enough protection from heat that I once was even able to grab a lit charcoal briquet to move it. For grilling, I prefer the half and half method, stacking all the coals on half of the grill and none on the other half, which allows me to have cooking zones. I can start the grilling over the hot zone for a quick sear and then move it over to the colder zone for slower cooking through. To move food, I avoid using cooking forks or other tools that pierce the meat, which leads to loss of juices. Instead I prefer tongs and a spatula. My favorite tongs right now came as part of a Pampered Chef grilling set, but it seems that the current version of the set has a very different set of tongs. My grilling spatula is a novelty item called the Sportula, that features a cut-out of the New England Patriots logo on it. I recently got for review a Cuisinart Teppanyaki Tool set that’s intended for Japanese hibachi grilling and I really like the spatula that it came with too, especially for turning delicate items like fish or vegetables. To check temperatures of grilled meats, I rely on the same instead-read thermometer I used for the kitchen: The Thermapen Mk4. It’s a little more expensive than other thermometers, but it’s dead accurate, waterproof, durable, and very convenient. My brother was recently singing the praises of the iGrill, which connects to your iPhone wirelessly and sounds pretty neat, but I don’t have a need for it quite yet. For the charcoal itself, I keep it simple. I use standard Kingsford Original Charcoal Briquets. I don’t need Match-Light because of the chimney starter, and while I’ve considered lump charcoal, when I’ve tried it, I found it burned too quickly and it was more expensive. Given how often I grill that expense would add up quickly. When I’m done grilling and the grill has cooled enough, I have a nice third-party grill cover.1. The Classic Accessories Ravenna Grill Cover is made for my particular grill and is constructed of a very thick and strong, coated fabric and has buckles at each corner to keep it on the grill all the way down to the wheels. It even has air vents to keep it from ballooning during windy storms. And it’s not too expensive. Some tools I’ve purchased over the years that I found I didn’t need include the Weber Char-Basket Charcoal Holders, which are designed to be filled with lit coals for the direct-indirect kind of grilling I do. However, I realized that just banking the coals on one side was sufficient and didn’t require fiddling with the baskets. I also have a vegetable grill basket I never use because I don’t cook anything that small on the grill that would fall through the grates. Thanks for this post – and thanks for putting the link on fb. I’m a Weber charcoal griller too. My grill was an anniversary present from the kids 30 years ago, still works! I don’t grill much now, but I replaced the grate when a few grandkids were diagnosed with celiac and now I avoid grilling any bread (hotdog and burger buns go into the toaster oven. Not the greatest, but a small thing to make sure everyone is safe.). I’ve used the charcoal chimney but also use an electric starter I got at Home Depot, not expensive. Somewhere – maybe ATK? – I read a caution about wire brushes and the suggestion to use crunched up aluminum foil to clean the grill. 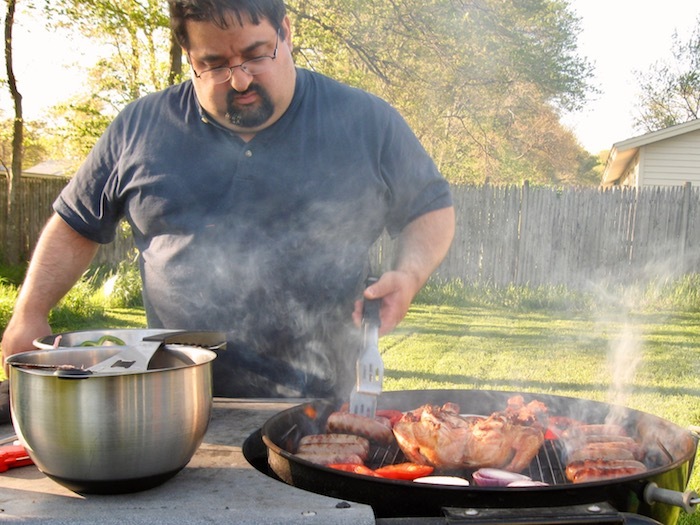 I love your grill and food pics – they inspire me to get to the grill. Keep the posts coming!